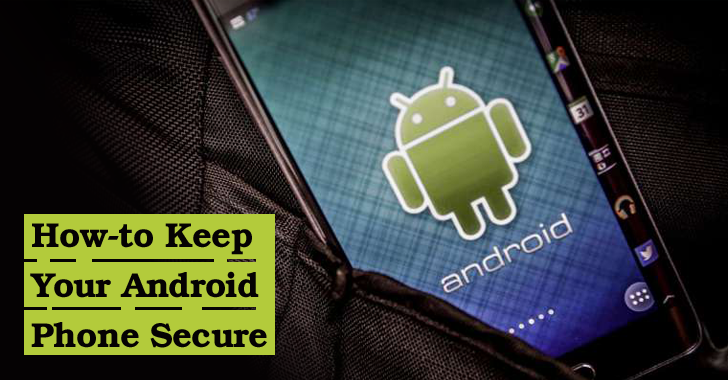 As the number of threats is on the rise, Android platform is no longer safe, which isn't a surprise to anyone. Most of us are usually worried more about the security of our desktops or laptops and forget to think about the consequences our smartphones can make if compromised or stolen. Unlike desktops, your smartphones and tablets carry all sorts of information from your personal photographs, important emails, messages to your sensitive financial details. And due to rise in mobile usage, the hackers have shifted their interest from desktops to the mobile platform. Nowadays, nearly all possible threats that were previously attacking desktop platform are now targeting smartphone users. Ransomware, Phishing, Spams, Spyware, Botnets, Banking Malware, OS and Software vulnerabilities, just to name a few examples, but users don't understand the potential threat when it comes to mobile devices. Additionally, your smartphones and tablets are also subjectable more threats like, Smartphone Thefts and unnecessary app permissions that allow even legitimate & reputed companies to spy on you. However, there are a number of solutions to solve all the above issues, but for that, you generally need to install multiple cumbersome and untrusted applications to your mobile devices. 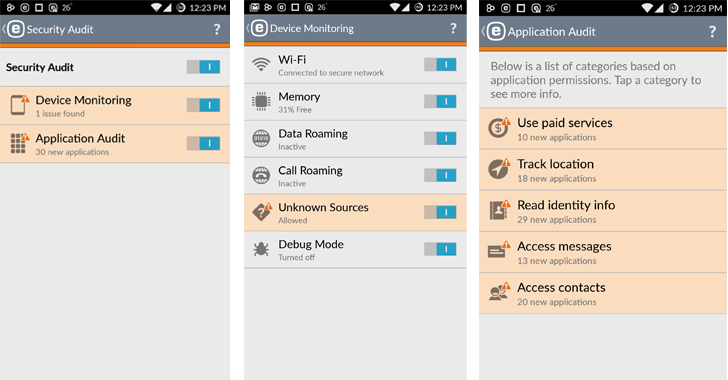 Like a good antivirus to resolve malware and virus issues, an app to manage Android app permissions, a device tracking application in case your device is lost or stolen and lots more and installing all these apps consume lots of space, RAM, the battery of your device. I frequently receive these types of queries from my readers who ask me for some good solution that could solve most of the security and privacy issues in one go. So I headed to Google Play Store and started searching for an app that offers a full suite of security and privacy tools. I came across some reputed apps, but they resolve few issues and some apps that address several issues but originate from some vendor I can’t trust. 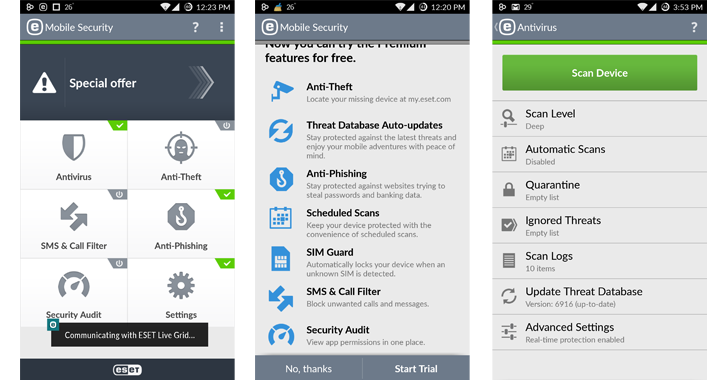 Then I came across ESET Mobile Security app, which comes from one of the reputed antivirus vendors, that is offering protection for all the threats we discussed above. As its primary role, ESET offers the best antivirus scanning for your smartphone devices with up-to-date threat database and clean mobile app interface. According to the latest test and review conducted by AV-TEST, an independent lab, ESET mobile security antivirus detects 99.9% of latest threats with the protection and usability score 6 out of 6. Moving further, I found 3 different levels of scanning available in the software: Quick Scan, Smart Scan, and Deep Scan. So, one can choose to perform any of the options one's feel suitable. I chose Deep Scan that scanned every data and files available on my phone. ESET Mobile Security also allows to access scan logs easily, and one can also have a look at quarantined items (suspicious files or malware) detected by the anti-virus. Moreover, the anti-virus feature is also offering a series of advanced antivirus options, including support for ESET Live Grid, detection of potentially unwanted or harmful applications and real-time protection. It is always unfortunate when our expensive mobile device is lost or stolen. Many apps in the market offer device recovery feature via GPS-based tracking, but many times these apps are unable to locate the device. Even if an attacker somehow gets access to the device, it is easy for him/her to uninstall the tracking app. But, I liked the way ESET Mobile Security Anti-Theft feature works. It is designed to help you easily track your lost or stolen device, and password protects your app so that no one can uninstall it, except you. Set a trusted SIM card within the app. In the case of lost or stolen, you can log into your ESET account at my.eset.com and track your devices through an easy-to-use web interface and ensure that all your data remains protected from unauthorized users. As soon as you mark your device as 'Missing' on the online portal, the location of your stolen or lost device will be displayed on a real-time map so that you can easily trace it. You can even view a list of IP addresses that your lost device was connected to. Bonus — 'Selfies' of Phone Thieves: Marked as Missing devices will automatically capture photographs with its back and front cameras, and then send them to the online portal, which helps you find the location of a missing device easier. But, What if your stolen device is not connected to the Internet? Like other apps, ESET Anti-Theft feature lets you send an SMS message command from a trusted number to remotely lock or erase your smartphone data immediately, as well as ringing it in case it has been lost somewhere nearby. 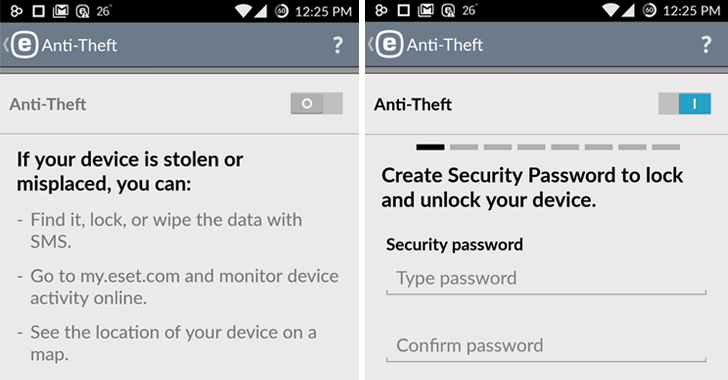 On the top of that, ESET Anti-Theft functionality provides a series of new features, like even if an unauthorized SIM card has been inserted in your stolen smartphone, you can send remote commands to it. Even if someone tries a wrong PIN or pattern on your smartphone, or insert an unauthorized SIM, your device will be able to take preventive actions on its own in an effort to ensure that your data remains protected. These features are something that most of us ignore while searching for a good mobile security solution. Today many apps, even legitimate, request for unnecessary app permissions. Some of your apps can make phone calls, track your location, read your browsing history, contacts, SMS, photos and calendar, and even share this data with third-party advertising companies without your knowledge. And since I'm security conscious, I always make sure which app is requesting what permissions and for this I found ESET Mobile Security best fit for me. ESET Mobile Security offers 'Application Audit' feature to help you know what permissions various apps installed on your smartphone or tablet have. You can click on any app listed in the Application Audit interface, which will land you to your smartphone’s settings menu, from where you can easily restrict unnecessary app permissions or even uninstall it. Besides this, the app offers you 'Device Monitoring' feature that will help you inform any necessary settings you haven't set correct that could compromise your security. Phishing emails, messages and even contacts are common these days. Hackers or malicious attackers can trick you handing over your sensitive accounts like banking, email or social media accounts access to them. So, it has become important for us to keep an eye on every email and message that we receive every day, but it’s not as easy as it sounds. This app resolves the above hurdle as well. ESET's Anti-Phishing feature offers an additional level of protection when you browse the web from your smartphone or tablet. Though the app doesn't support all browsers currently, you can choose the one that is present on the list of supported browsers to navigate the web. Besides all the above tools, ESET Mobile Security also offers text messages (SMS), and multimedia messages (MMS) and phone calls blocking capabilities to Android users. So you can easily opt to simply block calls and messages from all unknown numbers, or more interestingly, all or specific known numbers — with options for both incoming and outgoing blocks. 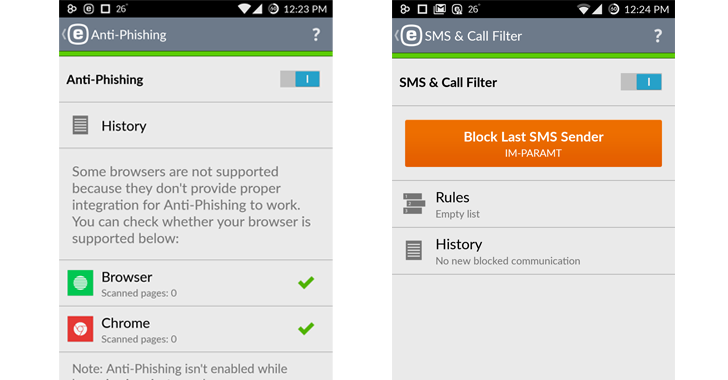 In short, I found ESET Mobile Security a package of security and privacy tools bundled into a single app. The app is fast, provides a user-friendly interface, keeps you safe from malware, protects against phishing attacks, with numerous other tools to keep your smartphone safe even when it's out of your hands. However, ESET Mobile Security app doesn't provide any Encrypted Cloud-based Backups, device encryption, which I will like to see in-built in the future. 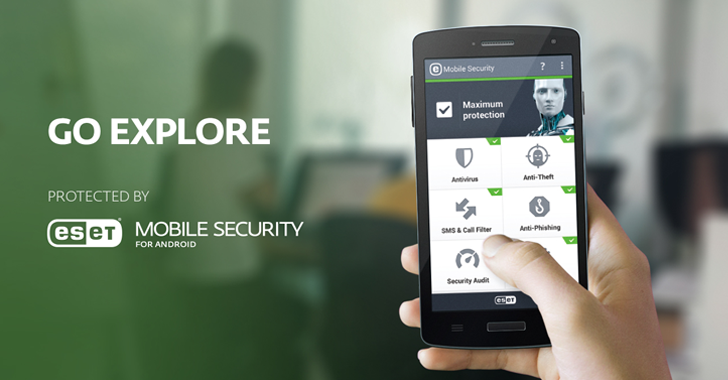 Overall, ESET Mobile Security for Android is a solid choice for protecting your smartphone or tablet with its top-notch malware protection and huge array of anti-theft and privacy-protection features. You can download and install ESET Mobile Security app for FREE for a lifetime from the Google Play Store if you are seeking for basic protection capabilities. However, those seeking for Advanced security and privacy protection on their smartphones should upgrade to a premium subscription, via in-app purchase.